Mainstream Hollywood is the name of the game at Regal Lloyd Center 10. A relatively smaller film might slip in here every once in a while (like Larry Crowne and Midnight in Paris, above), but this is by and large an “event” theater. This is where Portlanders come to see the midnight premiere of some long-awaited film that’s been hyped ad nauseam for months in advance. It’s where moviegoers can see all the latest and greatest CGI spectaculars on the largest possible screen. Last but not least — because the theater is so popular, accessible, and close to no less than two marketing research firms (both in the Lloyd Center, more on that later) — the Lloyd Center 10 is quite often used to show audience test screenings. It’s not at all unusual for lucky mall shoppers or moviegoers to be given a free ticket and a chance to help shape a movie before anyone else in the world has seen it. More About the Place: The Lloyd Center 10 was first opened on December 16th, 1986. The date has been immortalized on a plaque in the lobby, situated just over a time capsule that was placed during the theater’s dedication. Lloyd Center 10 was designed by Boora Architects, a prominent Oregon firm that went on to plan several other Portland buildings, including Clackamas High School (my alma mater) and the Mark O. Hatfield US Courthouse. The developer was Tom Moyer, a former theater chain magnate who went on to develop another local landmark, the 1000 Broadway Tower. I’ve heard it said that this theater’s architecture won a 1986 Peoples’ Choice Award, but I sadly can’t confirm this since all records of the event seem to have disappeared with the transition to online data storage. At the time of opening, Lloyd Center 10 was the first major multiplex in the city and one of the largest in the state. The theater also had a unique “island” box office in the center of what is now the lobby, in addition to two separate concession stands flanking a wide open area in front of the two main auditoriums. Both of these features were removed during a renovation roughly nine years ago, to stay competitive with the various other multiplexes that have been built in the past quarter-century. The old box office’s spot is presently marked by a red circle on the lobby floor, and a massive portrait of MGM movie stars circa 1949 now resides where one of the concession stands used to be. Though the theater has ten screens in total, its two main auditoriums are the main attraction of Lloyd Center 10. These two auditoriums feature the largest non-IMAX screens in the city, with 756 seats apiece (down from 900 before the renovation, to make the seats roomier), so there are plenty of tickets to go around in even the busiest of movie weekends. If you look closely at the above photo, you’ll notice that the west side of the theater was built with a nice covered area to line up for the box office. This line starts with a couple of benches near the front entrance and ends at the back of the theater itself, with a couple of annoying exit doors somewhere in the middle. For midnight premieres, advance screenings or especially popular new releases, people can and have lined up under this covering from one end to the other. I’ve even seen the line curl back on itself and grow twice as long. Still, it’s nice to wait in relative comfort, with some amount of shelter from the fickle Portland weather. Next to the alcove, you’ll find a series of plaques. For those, you can thank Kevin O’Keefe, the first general manager of Lloyd Center 10. Every year, the Rose City puts on an annual Rose Festival, complete with parades, beauty pageants and other various celebrations. Because O’Keefe was particularly friendly with the Portland Rose Society, he agreed to commemorate each Rose Festival with an annual plaque. On the theater’s sidewalk, you’ll find a complete list of Rose Society presidents, Royal Rosarian prime ministers, Rose Festival Foundation presidents and pageant winners for every year of the Rose Festival’s history (the ones before 1986 are all listed on larger group plaques and the ones after are listed on smaller individual plaques). The parking lot is also quite notable, partly because it’s larger than the theater itself. More importantly, though it’s technically for mall and theater customers only, the enforcement on that is quite graciously lax. There are no permits or tolls of any kind required to park there, which is a blessing for Tri-Met riders. The parking lot’s sheer size also comes in very handy during Blazer games or particularly busy weekends in movies. This is the Oregon Convention Center. People come here from all around the world to attend various trade events, graduation ceremonies and of course, conventions. 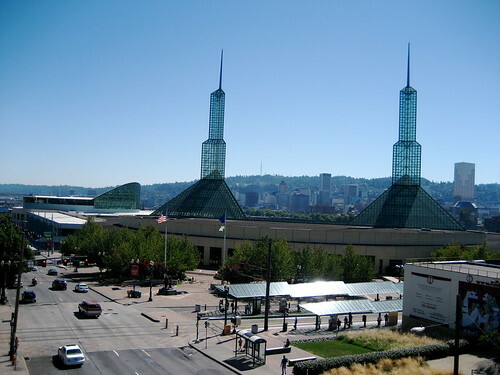 That would be enough to establish the convention center as a Portland landmark, but its iconic twin glass towers are also a treasured part of the Portland skyline. And as long as we’re in the area, let’s go pay a visit to the center’s noisier and more famous neighbor. Welcome to the Rose Garden Arena. First opened in October of 1995, the Rose Garden is our largest concert hall (over 14,000 permanent seats!) and one of the busiest public transit hubs in the city. 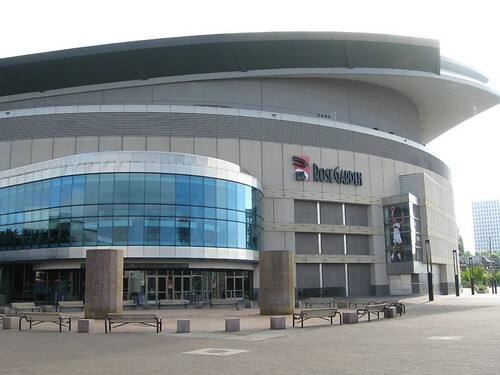 Most importantly, it’s the home of Rip City’s favorite sports team, the world-famous Portland Trail Blazers. But getting back to the Lloyd Center 10, there’s still its enormous namesake landmark sitting just next door. Lloyd Center Mall, the largest mall in Oregon and one of its oldest as well. Opened in 1960, the mall — and also the district that contains the mall — were named after California oil magnate Ralph B. Lloyd. He’d actually first thought of building a mall on Portland’s east side back in 1923, but plans were delayed by a world war and a sizable (some might say “great”) depression. The mall itself was designed by John Graham Jr., architect of the Space Needle, though the mall has gone through so many expansions and renovations that its original open-air layout is now long gone. Since opening, the Lloyd Center has been the defendant in two landmark court cases: Lloyd Corp. v. Tanner (U.S. Supreme Court, 1972), which ruled that Lloyd Mall can prohibit the distribution of handbills without violating the First Amendment, and Lloyd Corp. v. Whiffen (Oregon Supreme Court, 1989), which ruled that petitioners were free to gather signatures on mall grounds so long as they didn’t interfere with business. If you’re curious about this contradiction, the Supreme Court basically decided in 1980 that the matter of free speech in public shopping areas was something for the state governments to decide (PruneYard Shopping Center v. Robins). But I digress. Today, the Lloyd Center houses over 200 stores, kiosks and office spaces spread out over three floors. That isn’t even counting the Lloyd Center Tower, a 20-story building (which is really tall for Stumptown) connected to the mall by skybridge. The mall itself is so huge that it houses a second Regal theater, just behind the food court on the top floor. It might seem strange for Regal to put two multiplexes in such close proximity, but the Lloyd Mall 8 (that’s the one inside the mall) was first commissioned by Cineplex, so they were originally supposed to be competing theaters. Yet even before the Lloyd Mall 8 was completed, it was bought out by another company and eventually fell into Regal hands. On the ground floor, you’ll find a massive ice rink where Tonya Harding — one of our more infamous natives — first learned how to skate. The ice rink is always filled with skaters and even a curling club, except for when it’s filled with flowers every June for the Annual Spring Rose Show (part of the Rose Festival). To recap, the mall provides free parking, easy access to Tri-Met, two theaters, a food court and a wide variety of stores. It should come as no surprise that I’ve spent many an hour of free time here. Personal Memories: Too many to count. I’ve been coming to see mainstream Hollywood films at the Lloyd Center 10 for as far back as I can remember. This is where I first saw the Transformers premiere with my dad. That covered area in front is where I got stuck waiting to see Coraline. This is where Cloverfield made me so motion-sick I had to throw up after the show (luckily, my sister went with me and was able to drive us back home). This theater is where I saw Van Helsing, a film that I actually tried to defend at the time only to quickly realize — in a very important moment of personal growth — that it couldn’t be done. I bought my tickets here for the Scott Pilgrim midnight premiere, only to chicken out because I had a 5 am flight the next morning. I didn’t refund the ticket (to support the opening weekend gross, you see), and I later went back to the see the movie at the same theater. One time, I even came here for a “Fathom Event” screening. It was a simulcast of “The Magic Flute,” as directed by Julie Taymor and performed at The Met. Unfortunately, the simulcast was so beset with technical difficulties that the screening had long and frequent interruptions. The management finally had to offer everyone three complimentary movie passes per Fathom ticket, simply because that’s how much the tickets cost. Never since and never again. Once, back in the 8th grade or so, I came to the theater as part of a test audience for the first Tomb Raider film. I thought it was good at the time, but I was a teenager and it was Angelina Jolie, so sue me. More recently, I scored an advance ticket for a screening of Let Me In, but I had to decline due to scheduling conflicts. Perhaps my favorite advance screening in Lloyd Center 10 was another one that I didn’t actually get into: The test screening of Watchmen that I visited to try and cover as best I could. The Regal Lloyd Center 10 is one of the most popular theaters in Portland, and for very good reason. It’s easy to access by public transit or by I-84. It’s next to some of the most treasured landmarks on Portland’s east side. Not only are all of the hottest new movies (both 2D and 3D) on constant rotation, but additional content is readily available through Fathom and — for those lucky enough — test screenings. To those Portlanders looking for the latest and greatest big-budget releases, this is the place to go. P.S. Special thanks to Poy Wong, the general manager of Lloyd Center 10, who very graciously agreed to be interviewed for this article. 67 mySQL queries in 0.290 seconds.